Karlovy Vary is the most famous spa of the Czech Republic. It ranks among the youngest royal towns of West Bohemia. It was founded by Charles IV in 1370 according to the records in chronicles. 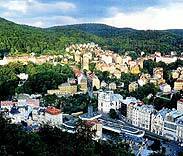 Karlovy Vary is much sought-for by guests from over than 80 countries of the world. The spa is suitable for the treatment of diabetes and diseases of the digestive tract. The drinking of water in particular, from 12 warm springs (of 42 - 72 centigrade degrees) belongs to traditional curative methods. The spring known as "Vridlo" is the most abundant one and squirts 10 - 15 meters high from a depth of 2000- 3000 meters below the ground. Besides treatments visitors can also play golf, tennis and do other sports or visit cultural events, entertainment programs and concerts. Also the Russian and Anglican Churches are worth seeing. The theatre building dates from 1896. The Grand hotel Pupp became the center of social and cultural life. Karlovy Vary is also a town of festivals, congresses and colloquiums as well as a place, which hosts meetings of significant personalities from the world of politics, science and culture. The traditional products of Karlovy Vary, which are glass, porcelain, mineral water and waffles, are well known in the world. The glass with a trademark Moser celebrates Karlovy Vary for more than 150 years. The famous herbal stomach liqueur known as Becherovka is produced here.